Four adjustable feet to provide from 1-1/4 up to 4 under clearance for leveling unit. Adds 2 to low height. 12 gauge solid steel cover; assists in applications involving pallets with minor damage. 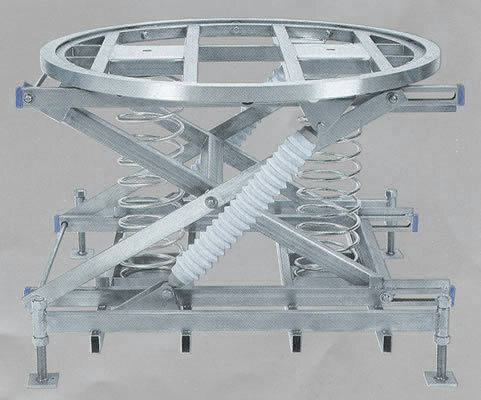 - solid steel plate with rounded corners welded to rotator ring. Manual locking attachment; shipped loose for field mounting to suit application. PalletPal is empty. Fork pockets are not useable with caster option. Vinyl, with alternating black and yellow 3" pleats. Not for use on SST PalletPal. See Pricing Below. UL for incidental food contact. These finishes also resist bacterial attack. dampener is standard enamel finish. Choice of spring range is included in this price. Note: Galvanized finish not available on the air actuated units. Loading and Unloading from your complete source for material handling equipment.